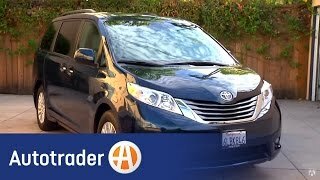 Toyota introduced the redesigned 2011 Sienna minivan at the Los Angeles Auto Show. 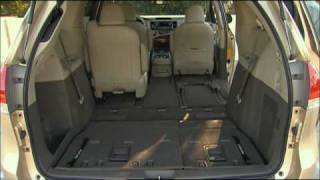 The Toyota Sienna is well known as a transportation solution for moving people and cargo comfortably and efficiently. A choice of two responsive DOHC engines will be available: a 3.5-liter V6 or 2.7-liter four-cylinder engine. Both engines offer the latest in efficient, lightweight technology, including Dual Variable Valve Timing with intelligence (VVT-i), roller rocker arms and an Acoustically Controlled Induction System (ACIS) that changes the length of the air-intake pipe to supply more torque on demand. Toyota unveiled the all-new, third-generation Sienna minivan at a media conference today at the 2009 Los Angeles Auto show. 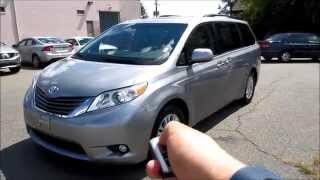 The Toyota Sienna is well known as a transportation solution for moving people and cargo comfortably and efficiently. The third-generation Sienna will look and drive more like a sedan, conform to new ideas about personal comfort, easily accommodate cargo, and handle big loads. 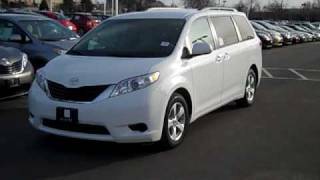 The 2011 Sienna has been reinvented to handle these needs as it shifts to a more expressive and dynamic vehicle with a stronger profile, high shoulder character and responsive handling. With state-of the art features and rewarding driving dynamics, it is a vehicle that car-lovers will find satisfying to drive. Sienna will offer new models, including a sporty SE and a four-cylinder powertrain, as it continues to be the only offering in the segment with an all-wheel-drive option. “The all-new Sienna is an example of Toyota’s commitment to lead the marketplace as it anticipates consumers’ needs and changes in lifestyle,” said Bob Carter, group vice president and general manager, Toyota Division, Toyota Motor Sales, U.S.A. The third-generation Sienna combines a contemporary style with features not previously seen in a minivan, and a fun-to-drive spirit that will surprise many, along with the flexibility, spaciousness and features that have defined the segment. The Sienna will come in five conveniently configured grades, all sharing a distinctly new visual direction and features. The third-generation Sienna explores a more modernly advanced and bold design. The sportier profile is complemented with distinctive window shapes. Working closely with engineering, Sienna designers were able to create a high and wide shoulder to embed a deliberately hidden door slider within the window graphic. In the front is a bold face design. Sophisticated headlamps angled higher than the grille lends a confident front presence. The sculptural rear corner separates the Sienna from boxy minivans as it surrounds the functional yet elegant LED taillights. The interior features upscale quality and elegance, yet every element are logical and functional. The distinctive swept shape of the IP creates the perception of increased personal space for both driver and passenger. Careful attention to the details adds extra value to each component. Sleek seat designs add flexibility and roominess while central climate and audio controls are integrated into a single graphic element. Overall, the new Sienna has a sportier, classier appearance. A Cd of 0.306 is the result of careful design work and is a contributing factor in maintaining a quiet cabin and providing excellent fuel economy. The 3.5-liter V6 makes 266 horsepower at 6,200 rpm, with expected EPA-estimated mileage ratings of 18 mpg city/24 mpg highway (16 mpg city/22 mpg highway on AWD models). It also has a 3,500-pound tow capacity. With 187 horsepower at 5,800 rpm, the 2.7-liter four-cylinder engine produces responsive power that exceeds some competitors V6 performance, while delivering expected EPA-estimated fuel efficiency ratings of 19 mpg city and 26 mpg on the highway. Both engines are matched with state-of-the-art, electronically controlled six-speed transmissions with sequential shift that provide smooth gear-shift feeling, quiet performance and a lightweight, compact size. The suspension uses front MacPherson struts, combined with rack-and pinion steering for smooth, linear steering feel. Electronic Power Steering (EPS) delivers a more solid direct on-road feel. With a wider stance, the new Sienna has a more direct steering feel. Under-body aero parts also contribute to dynamic performance. With five distinct model choices, the new Sienna can be tailored to a wide range of purposes and pocketbooks. 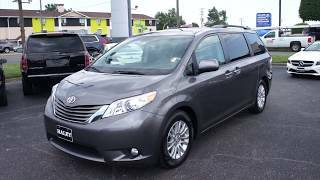 The Sienna can be configured with seven- or eight-passenger seating, in front-wheel-drive or all-wheel-drive, with a range of prices and features to accommodate different mixes of practical needs and high aspirations. The Sienna and LE grades are available with either the 2.7-liter four-cylinder engine or the 3.5-liter V6. The value-driven Sienna grade and popular LE are equipped with an array of standard features that include: cruise control, Daytime Running Lights with manual on/off feature, tri-zone air conditioning, six- or eight-way-adjustable driver’s captain’s chair, power windows with auto up/down and jam protection, AM/FM CD player with four speakers, XM compatibility, auxiliary jack, power door locks, remote keyless entry, and three 12V outlets, among other amenities. The Star Safety SystemTM, which includes Anti-lock Brakes (ABS), Electronic Brake-force Distribution (EBD), Brake Assist (BA), Vehicle Stability Control (VSC), and Traction Control (TRAC), is standard on all models. The LE V6 model is upgraded with even more features including dual power-sliding doors and power rear door, a power driver seat with power lumbar support, electrochromatic rearview mirror with Homelink™, backup camera, rear window sunshades, AM/FM/MP3 CD player, integrated XM® satellite radio (subscription required), auxiliary audio jack, USB port with iPod® connectivity, and hands-free phone capability and music streaming via Bluetooth® wireless technology, and steering wheel audio controls. These features can be added to the four-cylinder model as a package. The XLE builds on the LE, adding features such as leather-trimmed seats, moonroof, and an anti-theft system with engine immobilizer, remote keyless entry, and heated front seats. Select optional XLE equipment includes a 10-speaker JBL® premium sound system with voice-activated DVD Navigation and Panorama rear camera with integrated back-up guides, XM® NavTraffic (subscription required), rear-seat Dual View Entertainment system, and an auxiliary audio jack and USB port with iPod® connectivity. The Limited is designed for customers who want all the features with more luxury. The standard equipment list is extensive, including new second-row Lounge Seating and a power 60/40 Split & Stow third-row seat, front and rear parking sonar, dual moonroof, Smart Key, and Safety Connect™. Select options include those available on the XLE plus HID auto high-beam auto-high beam headlamps, rain-sensing wipers, and Pre-Collision System (PCS) with Dynamic Radar Cruise Control. Given its upgraded engineering, every Sienna will ride well and track cleanly through corners, but none more so than the newest addition to the line: the sporty SE. The SE is designed for those who appreciate an even sportier design with responsive performance. The front has a more aggressive appearance and the side skirting visually lowers the vehicle. Aerodynamic sculpting hugs the standard 19-inch alloy wheels, which are specially tuned for sportier handling. Separating the SE further from other grades, the smoked tail lamps create a visually prominent statement. The SE sits lower, on a sport-tuned suspension for quicker feedback and better handling. Additionally, the SE is built with exclusive instrumentation and unique interior colors and trim. Numerous storage bins, cupholders and cargo spaces have been strategically placed in convenient locations. A conversation mirror, integrated into the sunglass case in the overhead console, allows visual contact with rear seat passengers. Both seven- and eight-seat cabins can be configured for a full contingent of passengers, a load of cargo, or a convenient mix of both. In seven-seat cabins, the second row captain chairs slide 23 inches, moving to the rear to create legroom for the tallest passengers and easier ingress and egress. They can be moved forward close to the front seats to make it easy to care for a child passenger, while also allowing easy access for third-row passengers. A sliding center console on the XLE all-wheel-drive and Limited grades can be shared between the front seats and second row passengers. The illuminated console slides into the second row area to provide convenient access for both rows, so the need for storage and passenger comfort can be equally served. For even more passenger comfort, there is standard second-row lounge seating on the Limited grade, which includes leg and foot support. Second-row captain chairs on all grades have dual armrests, and a one-motion release mechanism in case the seat needs to be removed. On eight-passenger models, the second-row center seat can be removed and stowed in the left side of the rear-storage area. When the center seat is stowed, a cupholder and storage tray is revealed. The eight-passenger interior can easily be optimized for seven passengers, and quickly reconfigured back for eight. The 60/40 Split and Stow third-row seating folds flat with one motion manually, with the Limited front-wheel drive receiving a power feature. The third row has been moved about two inches rearward for enhanced comfort. With the third-row seat in use, there is enough storage for five golf bags or four large suitcases. Four handy grocery hooks, with two in the back and two in the second row seatbacks, add storage convenience. A Toyota first rear-seat Dual View Entertainment Center is another innovative option. The system uses two displays side-by-side to create a seamless 16.4-inch widescreen image from a single source. When two separate entertainment options are called for, the system can split the screen into two individual screens, each with input from separate sources. Used as a single screen, it can be easily seen from the third row, and it can be operated from any seat via remote control. Used as two screens, the system can accommodate the preferences of two separate passengers who might want to play a video game or watch a second DVD simultaneously via auxiliary inputs. Other technological upgrades include a Toyota-first Panorama Camera rear monitor. It provides two views behind the vehicle including a 180-degree view, and on-screen back-up guides, helping drivers to reverse out of parking spots or driveways. An enhanced version of Toyota’s Vehicle Stability Control (VSC) is standard on all 2011 Sienna models. VSC coordinates the Anti-lock Brake System (ABS), Electronic Brake force Distribution (EBD), Brake Assist with Traction Control (TRAC) and Electric Power Steering (EPS), to help provide a the driver a better-integrated, controlled vehicle in the event of an emergency maneuver. A Pre-Collision System (PCS) with pre-collision seatbelt system is an available option on Limited, as is the latest in advanced vehicle control technology: Vehicle Dynamics Integrated Management (VDIM). The VDIM system coordinates brake control with engine output and steering inputs, allowing all the control and safety systems to cooperate seamlessly. Unlike reactive traction systems, VDIM operates proactively. During normal driving, the system works smoothly to enhance control even before the vehicle reaches its limits. The new Safety Connect™ telematics system is standard on Limited and optional on XLE. Safety Connect offers four safety and security features: Automatic Collision Notification, Stolen Vehicle Location, Emergency Assistance Button (SOS), and Roadside Assistance. A complimentary one-year trial subscription is included. Pushing the in-vehicle “SOS” button allows drivers to reach the response center to request help in an emergency as well as for a wide range of roadside assistance needs. If a Sienna equipped with Safety Connect is stolen, agents can work with local authorities to help locate and recover the vehicle.